This new project aims to provide sanitation and dignity to communities in Mewat, India. We estimate that up to 3,000 people a day will benefit from the availability of private toilet facilities and free compost this will provide. We also believe that this project will prove to have significant multiplier effects with health and welfare. 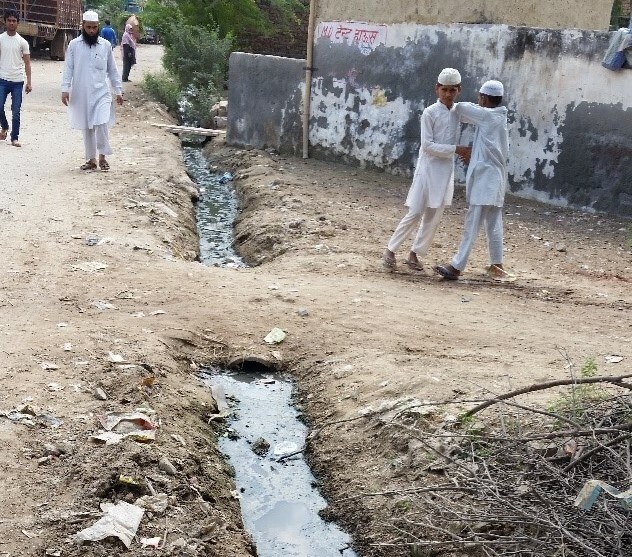 Most of the schools and houses in Mewat do not have toilets or other private sanitation facilities. There is strong empirical evidence that the lack of sanitation facilities or long distances between school or home and private sanitation is a direct cause of violence against women, school drop out rates for girls, poor maternal health, and infant mortality. Conservative religious practices make it almost impossible for girls to attend school where sanitation facilities are unavailable. programs that enhance communities’ awareness of the benefits of safe water, sanitation and hygiene. Our application to supply and build 250 flushing toilets with hand washing sinks in the village of Nuh, Ghasera has been approved for a total project outlay of about AUD$100K by The Rotary Foundation. Sample constructions are now complete, and construction of the actual toilets for the project will commence once the monsoonal rains have passed. It is expected to take about 4 months to complete once started. 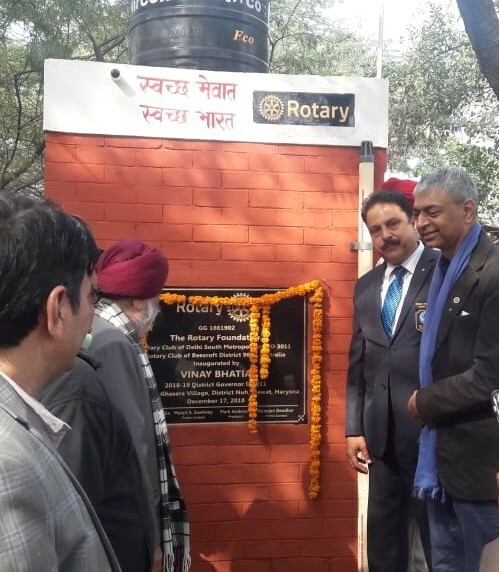 “The Rotary Club of Beecroft has partnered with Rotary Club of South Delhi Metro to improve health and sanitation outcomes in rural Mewat, in the state of Haryana in India. Provision of toilets for rural communities is also in line with the Government of India’s Clean India campaign and has been recognised as a critical element of improving health and sanitation for families and providing dignity for women in particular. 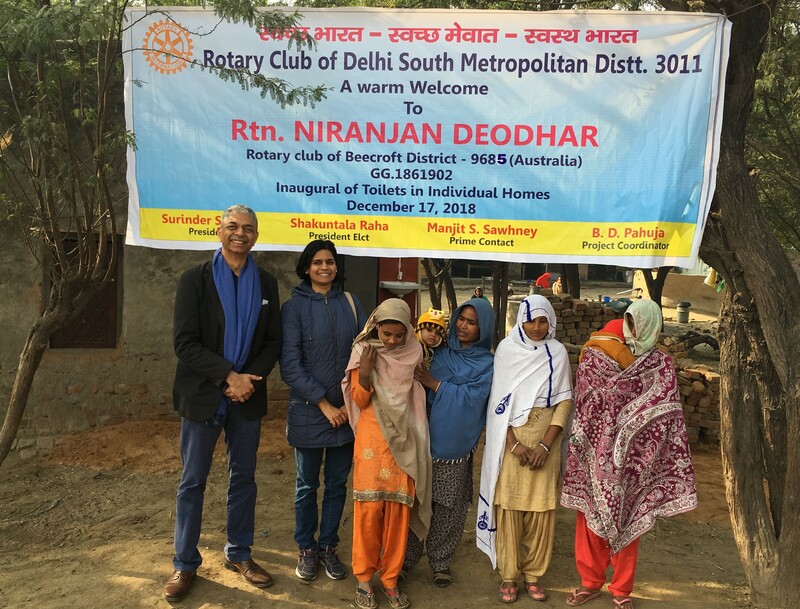 Rotary Beecroft members Niranjan and Vinita had the privilege of joining PDG Manjit Sawheny of Rotary Club of South Delhi Metro District 3011 on a visit to Mewat in December 2018. During the visit we reviewed the construction project and attended the inauguration event. A total of 250 toilets will be completed by March of this year. They met with many of the residents of Ghasera and Nuh. In both places, and across all the houses we visited, we were greeted with enthusiasm and thanks for the work being done. It was obvious from the personal stories narrated by the residents that access to basic hygiene had made a big difference to the health and dignity of everyone, in particular the women of the village. I met an old lady who was visual impaired. Before her house was provided with a toilet, she used to walk slowly for 30 minutes each way, while assisted by a family member, to get to a spot in the fields where she could have some measure of privacy. Vinita spoke to women folk of a number of households and reported similar themes. We inspected toilets that had been recently built as well as those built in previous rounds to ensure that on-going maintenance and usage was as desired. Previously built toilets were in good condition and had all the signs of being maintained and being in use. The current project is expected to be complete by March. About 90% of the houses in the selected villages will have been covered by then. This is through a combination of Rotary projects, government initiatives, and some relatively well-off households taking the initiative to invest on their own, in response to the progress they see around them. The village panchayat (council) in Nuh had organised a ceremony attended by over a hundred people, at which the importance of on-going maintenance and cooperation by the beneficiaries was reiterated. The host club had also arranged for the Development Officer from the State Government to join us, address the audience and stress the same message. We were humbled to see how the funds being raised by the Rotary Clubs and districts that contributed to this project were leading to real outcomes for real people." It's amazing what Rotarians can achieve when we work together! We want to SHOUT OUT A BIG THANK YOU to the Crows Nest Rotary Club, Sydney, Australia who helped get this project over the line and sharing in our vision by providing significant contributions as well as DDF from D9940 Lower Half of the North Island, New Zealand and D7640 New Jersey, USA.